One of the known risks of becoming reformed is that you sometimes have to re-examine some of your long held beliefs about what the Bible actually teaches. This is certainly the case when it comes to the mode of baptism. Most Americans equate baptism with immersion, so they are surprised (sometimes even offended!) when they witness their first baptism in a reformed church. While reformed Ministers do believe that baptisms by immersion are appropriate, they would never insist that they are necessary. Reformed Pastors are just as happy to pour or sprinkle. Nothing could be further from the truth. All the Reformers identified the Pope of Rome as the Antichrist (an observation with which this reformed Pastor most heartily agrees). The actual reason we do not insist on baptism by immersion is because the Bible does not insist on it. Yes, this is where the conversation usually tends to get long and complicated, but let me just share a few verses from the NT which prove that things can indeed be “baptized” without being completely immersed in water. While John may have immersed people, the NT never describes the Spirit’s mode of action as immersing, but as “come upon”, “pour out”, “shed forth”, and “fell on” (Acts 1:8; 2:17,33; 10:44; 11:15). Yet both acts are called baptism. While it is possible that the pharisees’ pre-dinner hand baptizing ceremony involved dipping their hands into water, there is no way they immersed entire dinner tables. Yet both actions are called baptism. If you keep reading the chapter, you quickly find three examples of these “divers baptisms” given in vv. 13, 19, and 21 where the words “sprinkling” and “sprinkled” are used. Yet still these washings are called baptism. The church in the wilderness was certainly not “immersed” into Moses, they did not even get wet while walking through the sea, and nothing is ever said about them entering the cloud in any way. Yet all three are called baptism. 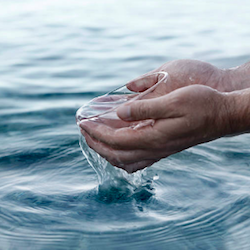 So here is the big question: If “baptism” can mean washing, sprinkling, pouring, and becoming connected unto someone or something in these verses… then why can it not also mean that in other verses? Thanks for at least thinking about it.